Jared Clifton, a trumpet player & composer from the greater Cincinnati area has played with the likes of John Von Ohlen and JD Allen. 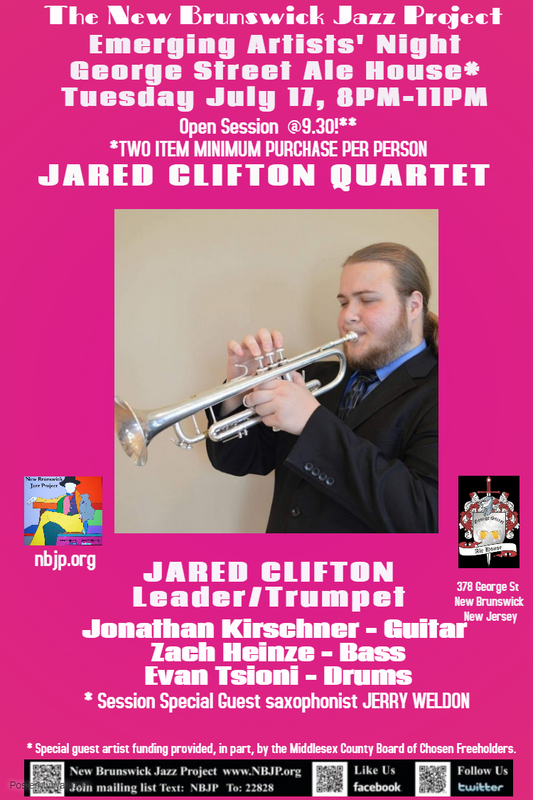 Jared now lives in NJ and has been playing with bands of various styles including dixieland, salsa and jazz. 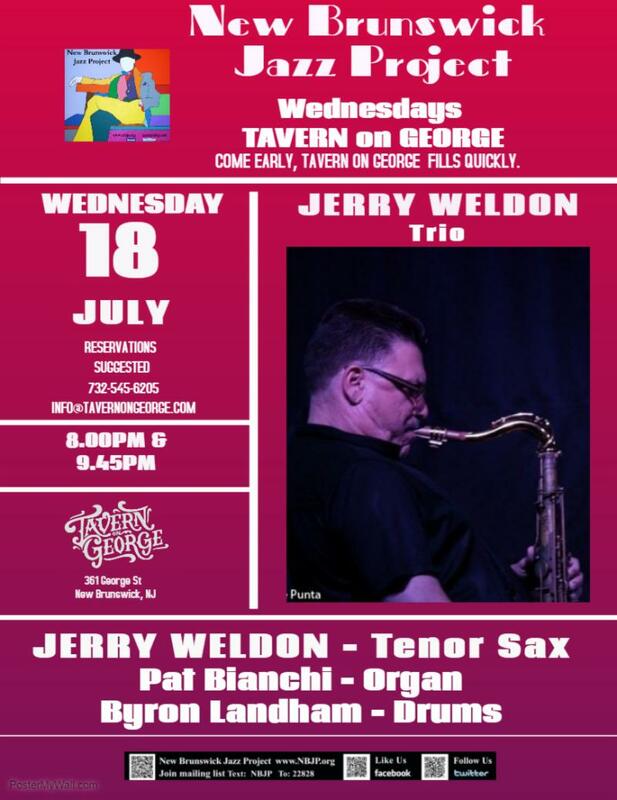 Our Session Special Guest Artist* is saxophonist Jerry Weldon. A legendary tenor saxman, Weldon is noted for his work with Lionel Hampton, Jack McDuff & Jimmy McGriff. In 1990, he became a charter member/ featured soloist with Harry Connick Jr.'s new big band. Since then Jerry has toured the world with Harry and can be seen daily on HARRY, Connick's daytime TV show. Weldon has worked with Joey DeFrancesco, Bobby Forrester, Dr. Lonnie Smith, and Mel Rhyne, Al Grey, George Cables, Cedar Walton, Roy Haynes, Jimmy Cobb, George Benson, Earl Klugh, Mel Tormé and many other jazz legends. Jerry also plays with his own bands in clubs worldwide. We first met Alexis when she was just 13--now 17, her career is taking off and we are thrilled to welcome her back. The Newark native who currently lives in Plainfield, began singing in church at the age of three. 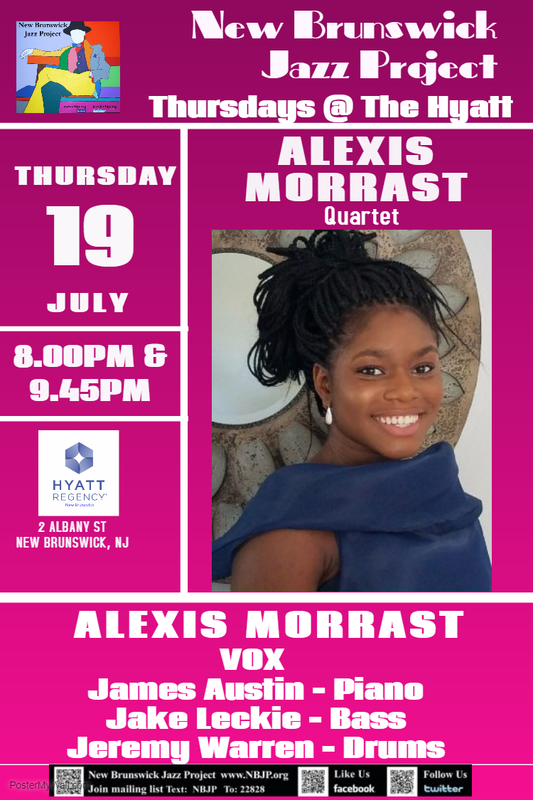 Since that time Alexis has performed at U.S. OPEN, Central Jersey Jazz Festival/ New Brunswick, NJPAC with Christian McBride, South Jazz Parlor in Philadelphia and Millennium Stage at The KENNEDY CENTER. In February 2017 she won first place on SHOWTIME at the APOLLO hosted by Steve Harvey. Alexis was also the 2017 HOT HOUSE Magazine "The Best UP and Coming Young Artist Award" and has performed in South Africa and at a number of festivals and venues throughout the us. She most recently toured Austria. Molly Mason, a native of Seattle, followed music to the East Coast and earned a Masters in classical voice from Boston U. Molly's focus switched from opera to jazz when she found a love for the freedom and creativity the music offers. 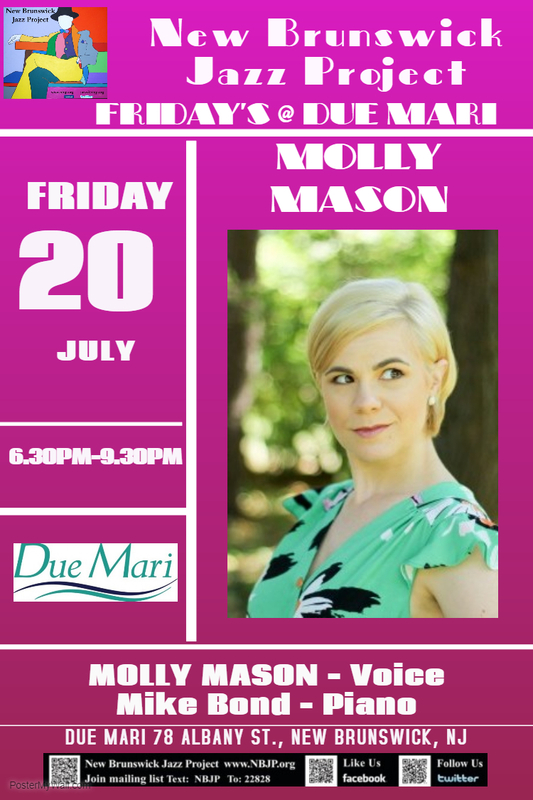 Molly Mason can be heard performing favorite standards, new compositions and modern arrangements in clubs and concert venues across the Tri-State area as well as running her own voice studio. Michael Bond started playing piano when he was 4 years old and by the time he was 6, he was playing in Weill Recital Hall at Carnegie Hall. After competing classically for 7 years, he began studying jazz. He was mentored by artists Stanley Cowell, Jim Ridl, Orrin Evans, and Mike LeDonne. Bond has shared the stage with many notable artists including: the Captain Black Big Band, Conrad Herwig, Tim Warfield, Josh Evans, Curtis Lundy, Duane Eubanks, Joe Magnarelli and many others. He has performed at the Central Jersey Jazz Festival, the Canadian Music Festival in Toronto, and the NYC Winter Jazz Fest. Mike is a featured artist on guitarist Jean Chaumont's upcoming debut album "The Beauty Of Differences." 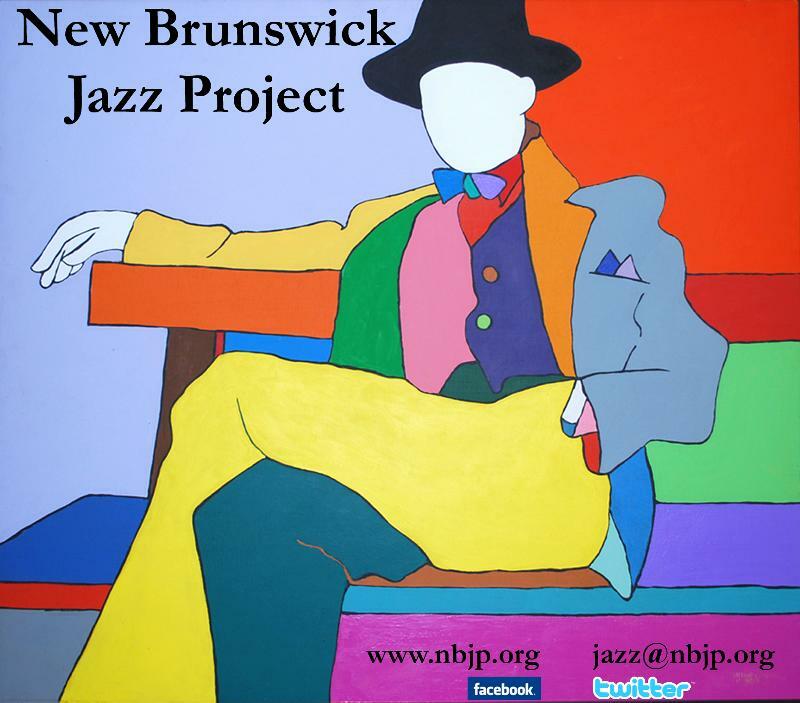 New Brunswick Jazz Project is now a part of AmazonSmile, where Amazon donates 0.5% of the price of eligible smile.amazon.com purchases to the charities selected by customers.